Correspondence was originally launched as a solution for occasionally connected smart clients. It provided local storage, queuing, and synchronization for Silverlight and Windows Phone applications. This satisfied some common scenarios (collaborative mobile apps, out-of-browser business applications, etc. ), but left a significant gap. 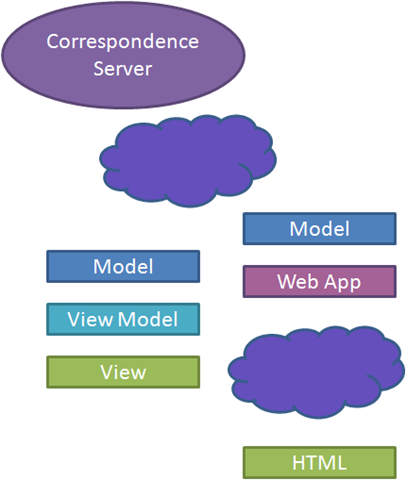 Correspondence 1.3 closes that gap by adding support for MVC 3. As the back-end data store for a web application, Correspondence enables many more use cases. Some of these use cases are difficult to achieve with other alternatives. A cloud-based application works fine in an isolated silo. But it is much more difficult to integrate a cloud application into an enterprise solution, especially when mission-critical business processes run on-premises. Correspondence brings the cloud and enterprise together. A cloud-hosted web application connects to a Correspondence Synchronization Server, just as a client would. The web application has its own local cache of the shared data, but it continuously synchronizes that cache with other consumers. A service located within the enterprise can subscribe to facts published on the web, and publish its results back to the web application. For example, suppose you wanted to host an e-commerce web application in the cloud. This would give you the elasticity you require to scale up during peak load, and back down again as demand falls off. However, you want your ERP system to run in-house. With Correspondence, your web application publishes orders that the customers place on-line. Your ERP system subscribes to those orders, fulfills them, and publishes status. Users log on to the web site to check order status. A web application, whether hosted in the cloud or in your own datacenter, is an active accumulation of data that must be regularly backed up. How frequently should you back up your database? How much data loss can you tolerate? How quickly can you get back on-line after restoring from backup? If your web application is backed by a Correspondence Synchronization Server, then your data is backed up continuously. You don’t have to plan downtime for maintenance to take a snapshot of your database. And when your server goes down, simply stand up another one and point it to the same Synchronization Server. It will pull down all of the data. Better yet, have the backup standing by live, pointing at the same Synchronization Server as the production system. Data will be automatically synchronized between the two systems. When production goes down, switch over to your hot backup and minimize the interruption in business. And when you can restore the production system, it will synchronize and pick up exactly where the hot backup left off. Correspondence works well for WPF, Silverlight, and Windows Phone applications. These cover a large number of platforms, including Windows, Mac, and Phone. But what if you want to run on an iPhone, iPad, or Android device? What if the user you want to reach doesn’t have Silverlight installed? With a Correspondence MVC 3 application, you can create a web alternative for your rich application. Go ahead and serve the Silverlight client on the web site. But if the user doesn’t have or cannot run the browser plug-in, replace the static Download Silverlight image with an HTML-based experience. Many of the popular apps on mobile devices are rich front-ends to web applications. Twitter, Foursquare, Facebook, and TripIt are all great examples. Each of these web applications has a custom REST API designed for use by mobile applications. If you want to build a web application with a rich mobile client, don’t spend your time writing REST APIs. Use Correspondence as both your web and mobile application back end. The app will synchronize with the web through the Correspondence Synchronization Service. Your web application is collecting valuable data. You want to report on it. But the application database is not optimized for reporting. And any reports that you run against the application database will hurt production performance. Correspondence 1.3 includes a new SQL Server storage strategy. This is a great choice for caching data in the web application, but it also works well as a back-end for an on-premises reporting server. Write a service that subscribes to facts, and turns them into inserts, updates, and deletes against a relational store. Run your reports against a local relational database for the best possible performance without impacting transaction processing in production. Visitors to your site are only there for a short time. You need to entice them to come back. The best way to do that is to engage your visitors in a collaborative workflow. They leave an email address, and you give them regular updates. They leave a comment, and you respond. If you rely upon traditional tools, you will be using the same web site as your visitors. But while they are casual guests, you are a permanent resident. You should be able to take advantage of a rich, responsive application. A Correspondence-backed web application synchronizes with a rich Correspondence application. You can build the best possible experience for yourself, and still get the reach that you need to engage with your customers. These are just some of the use cases that Correspondence for the web enables. Watch this short video for a demonstration, and sign up to get started building your own collaborative site. Correspondence for the Web and WPF from Michael L Perry on Vimeo.